The capital city of the Peoples Republic of China (PRC), Beijing (Peking) is a fast-growing, dynamic metropolis that, while courting foreign businesses and visitors, maintains a firm grip on its rich cultural heritage and a strictly Communist social order. It is a monolithic showcase that can give a distorted view of China to foreign visitors. 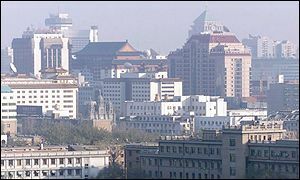 Beijing is a modern city with high-rise buildings, shopping malls and vast international hotels connected by an intricate freeway system crisscrossing the city. In the rush hour, traffic jams can match those of any major city around the world and the ringing of mobile phones is incessant. However, the modern buildings conceal traditional hutongs, parks, numerous architectural treasure and exquisite yellow-tiled temples whose prayer flags and wind chimes move in the breeze created by the passing traffic. Beijing became Chinas capital in 1421 and was to remain so until the collapse of the imperial regime in 1911. It was not until the late 19th century that Westerners were allowed to reside there and all trading links had previously been restricted to Canton. From 1911 to 1949 Beijing suffered, as did the rest of China, from the wars fought between various factions trying to take control of the whole country. The Japanese invasion in 1931 was followed by a bitter civil war, which finally led to Communist supremacy under Mao Tse Tung and the founding of the Peoples Republic of China with Beijing as the capital. The first ten years of his rule were successful in many ways. Stability returned to the whole country and great advances were made in industry, agriculture, education and health care. However, in 1966, Mao launched the Cultural Revolution, an attack on his more liberal political colleagues, which was to result in several years of anarchy throughout the country. Following Maos death in 1976, China gradually began to open up, welcoming foreigners as investors and as tourists and local Chinese were granted permission to set up businesses. Beijing is now keen to prove what a thriving commercial capital it has become. A good place to start exploring the city is Tiananmen Square, where Mao Tse Tung declared the foundation of the Peoples Republic. Today, the Square is more closely identified with the suppression of the student-led pro-democracy protests of 1989. To stand  alongside thousands of visitors  and see the imposing majesty of the Forbidden City to the north and the vast portrait of Mao Tse Tung on the Tiananmen Gate itself is to appreciate the awesome hold that Chinas rulers have always had on the people. An unmissable experience is a morning visit to one of Beijings public parks. This is when people let their hair down by indulging in their particular favourite physical activity, be it taichi, jogging, singing or even ballroom dancing. Beijing is at its best in late spring and autumn. Autumn is a particularly pleasant time to visit as the days are warm and the leaves of the many trees in the city turn glorious shades of red and gold. The heat and humidity of the summers and the biting wind in winter can be extreme.